Twilighters continues to thrive at POTC, as a “club within the club”. The prime (senior) male athletes of Park Orchards gather on Wednesday nights at the tennis club for some competitive social tennis followed by after match socialising and general bonhomie. 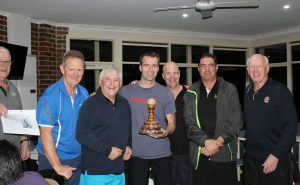 The group occupy the courts on Wednesday nights with the formal competition over the summer months and the more casual gathering over the winter months. Twilighters contribute to the club committee, help fund improvements and support social functions within the club. The Twilighters have been competing since 1980 and we have completed our 37th year. Ten teams competed for the honours this year with 70 players including 4 new members. Congratulations to Daniel DiConza’s team . “Eul less” who took the honours over Alan Williamson’s “Dalry D*1heads”. The Eus Less mob consisted of Daniel DiConza, Dave O’Connor, John Hoskins, John Lewin, Colin Potter, Michael Huntington and Andy Currie (who never turned up). We play social tennis but the competitive juices are never far from the surface. Dan’s team were on top throughout the season and the magic team formula of reliable attendees with a modicum of talent again proved successful. The boys continue to play after the formal competition with 4-5 courts regularly in use every Wednesday night throughout the year. 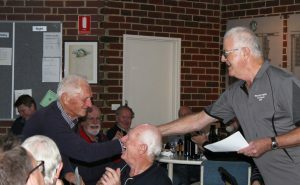 We held three dinners over the season, the Christmas in July (August) Dinner, the Christmas Dinner and the traditional Grand Final Dinner. Each dinner has a different theme and a variable group of organisers. The outcomes are equally memorable and very popular with the guys. 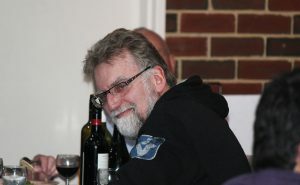 Our grand final Dinner was the usual boisterous extravaganza celebrating the end of another season. Resident stand up comic, Paul Marris handed over the 2017 Golden racquet award to the often mentioned and regularly libelled, Leigh Nitz. Our special dinners are catered the team of Trevor Street, Peter White, George Macrokanis, Bob Britton, Tony Gibson, Mark Dimech, Alex Goetzke, Alan Williamson, Paul Marris, Greg Jones, George Macrokanis, Bob Hadley, Steve Scott, Archie Marmarou, Mark Lowther, Mark Duffy, Theo Tsatas, John Kulesz and many others who readily help out. Some of these guys particularly claim catering credits but we know their partners actually do the work and deserve our gratitiude. (Apologies for any omissions, you know who you are !) Thanks also to those who came early to help set up and clean up after the dinners. 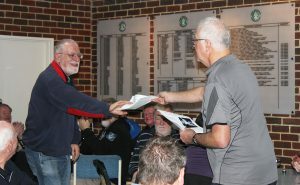 Two card nights were held with each a great success thanks to Alan Williamson, Archie Marmarou. Nice to see a number of partners and family members joining the fun. 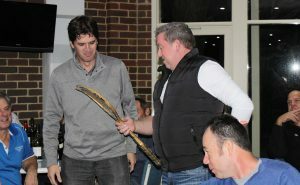 The Twilighters sponsored a social day for all POTC members at the Healesville Racing Club Picnic Race Day. We filled John Trenfield’s bus and a number drove themselves. In all around 50 members and partners attended on what turned out to be a glorious weather day. We started with a diversion to St Huberts for a mid- morning wine tasting then headed to our exclusive marquee trackside to enjoy a shared picnic lunch. The convivial atmosphere was infectious and helped by some enthusiastic punting results. The informed track and punting experts soon demonstrated why they are still poor. Greg Jones conned the attendees into another shared punting scheme. Fortunately he did not lose the lot and announced a small cash surplus on the way home which ended up in the Twilighters consolidated revenue fund. The partners especially seemed to have a great day and are keen to repeat the event. Tentative plans have been arranged to attend the Alexandra Race meeting in late October 2017. Hopefully news of the success of the day will spread and we can encourage more members to our attend. Thanks to Alan Williamson for organising the day and to John Hoskin for sponsoring the Twilighters Cup Race and the marquee hire. The Park Orchards Cup match between the Twilighters and the Park Orchards Sharks footballers was unfortunately cancelled due to a rescheduled practice match venue. Well that was their excuse anyway, we know they were dreading being walloped on the courts by the skilled elderly Twilighter champs. At least our unbroken winning streak continues and we retain the cup for another year. Hopefully we can repeat the annual event next year as it provides a popular opportunity to socialise and foster support between our two clubs. 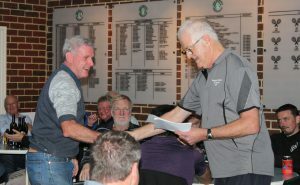 34 players lined up for a repeat of the Twilighters Golf Tournament and lunch at the RACV Healesville Country Club. The weather was again perfect, slightly chilly for the first few holes but a rain and wind free sunny day ensued. Scientifically calculated handicaps based on known and fictitious reports of golfing skills were allocated and teams selected to ensure the usual even competition. The new all star team of Mark Hamilton, Rob Ameer, Jeff McMahon and Leigh Nitz blitzed the course with a score 59 off the stick and took home the trophy. 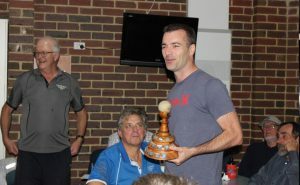 Leigh has promised to upgrade the amateur wood work of Greg Jones and improve the appearance of the famous trophy. Three other Twilighters joined us for an extended lunch and the a very merry bunch heading home in the JT Bus. All in all a great day was had by all. Thanks to excellent support from the RACV and our booking officer Greg Jones. Our annual trip is a bit later this year and more adventurous as we head to Darwin for 4 days. 15 starters are attending with several combining the trip with a holiday with partners before or after the official trip dates. More news after we get back. The success of the Twilighters is driven by the many volunteers behind the scenes who ensure each Wednesday night happens without fuss. A big thanks to the team of Trevor Street, Bob Britton , Peter White and George Macrokanis who have managed Twilighter social needs brilliantly throughout the year. John Gayfer and Bob Hadley have continued their support while coping with recovery from illness. 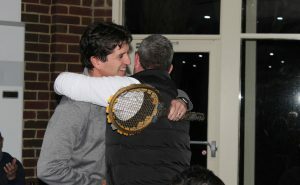 Twilighters will continue to enjoy the club throughout winter with casual social tennis on a Wednesday night. We look forward to enjoying the rejuvenated clubhouse facilities during the coming year.